Although the campaign for an elected, representative school board took a hit in City Council when a ward ballot advisory referendum sponsored by 10 aldermen was blocked on July 23, the petition drive to get the matter on ballots on November 6 continues for a few more days. 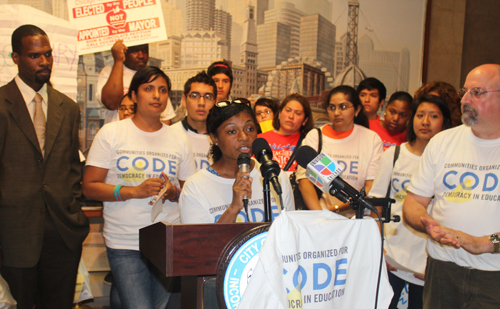 Tonya Payne, of the 19th Ward Parents, speaks at the CODE (Communities Organized for Democracy in Education) press conference July 25. Portions of speeches by Jawanza Malone (far left), the executive director of Kenwood Oakland Community Organization, and Phil Cantor, a CTU and Teachers for Social Justice member, (far right) are included in this article. Organizers are in the final weekend of petition drive in more than 300 precincts in Chicago. Substance photo by Sharon Schmidt. “Democracy will reign in Chicago,” said 19th Ward Parent Tonya Payne, the opening speaker at the CODE press conference at City Hall on July 25. CODE (Communities Organized for Democracy in Education) is leading a campaign to change the law in Illinois to allow Chicago voters to elect their school board. (See a list of CODE's member organizations at the end of this article.) CODE wants to see an overwhelming vote on November 6 in favor of Chicago voters’ right to choose an elected school board to use as leverage in Springfield with legislators. 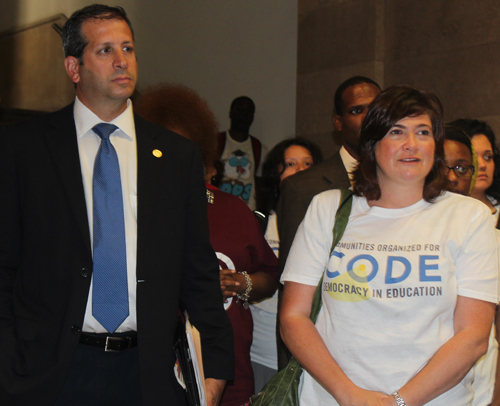 Alderman John Arena (45) and Raise Your Hand founder Wendy Katten at the CODE press conference. Arena was one of 10 aldermen who attempted to get the elected school board question on the ballot in their wards. Substance photo by Sharon Schmidt.Members of CODE will finish canvassing targeted precincts this weekend. Petitions are due on August 6. Organizations are calling on volunteers for one final weekend. CODE began the petition drive in June. In order to put the question on ballots in Chicago precincts, 8 percent of registered voters in the precinct must sign the petition. There are 2,369 precincts in 50 wards in Chicago. CODE targeted more than 300 precincts to canvass. John Arena (45th) one of the 10 aldermen who tried to get the referendum on ward ballots through the City Council, spoke at the press conference of some “interesting examples of the nature” of the council. First he mentioned the fight over food truck regulations, then he spoke about Ald. Joe Moore, who had blocked the referendum question broke to the council by 10 aldermen. “When an alderman, with whom I had looked forward to working with, turns on 10 of his colleagues by blocking our prerogative to communicate with the voters of our wards, simply to curry favor from the fifth floor, I can’t restrain my disappointment,” Arena said. “The good news is we are here with a large and vocal group that will continue this dialogue. “While they may believe that this battle has been won, I suggest it is not. By making this so much about process and transparency they have shown their hand. They do not support transparency. They honor pettiness over dialogue with the residents of the city. This question has been asked and elevated due to these political maneuvers. We will have a conversation about an elected school board for CPS. “The question will be on ballots in November in precincts throughout the city. The work done and that which lies ahead will ensure that voters will weigh in precinct by precinct. This issue is over the fundamental right that we may elect those who tax us and spend our money. And there is no more important a bill to pay, no more important a right due our children than education. The movement you started will go forward. Your passion has carried it and it has carried me through an educational week. For this I thank you." Scott Waguespack (32nd) Roderick Sawyer (6th) also spoke at CODE press conference. Pat Dowell (3rd), Leslie Hairston (5th), Toni Foulkes (15th), Ricardo Munoz (22nd), Nicholas Sposato (36th), and Timothy M. Cullerton (38th) were also part of the City Council group that attempted to get the elected school board question on ballots in their wards. Fioretti talked about the problem with an appointed school board — no representation by the people — and machine politics. Waguespack also spoke out against the politics played in City Council. Sawyer promised there will be an elected school board. Jawanz Malone, executive director of the Kenwood Oakland Community Organization, said he was disappointed that the aldermen’s move was blocked, but reiterated that a peoples’ movement would prosper. “We’re disappointed because yet again the mayor of this city is working behind the scenes to take the power away from the people, to take the power away from our representatives who are in office to do what need them to do,” Malone said. “How can the mayor of this city take that power away from us? Well, he’s not. We are in these precincts, walking door to door to make sure that the people who want an elected, representative school board get that. “While the mayor’s actions are disappointing it does not slow our momentum one bit. This is not going to stop us. There are points in history when people take control and overthrow their tyrants. This is one of those times. We are done letting people make decisions for us who don’t care about us. We want people in those seats who don’t just care but they show us they care and do what we need them to do. We need them to make sure that our children learn and our children are safe and make sure that our children have the type of lives that all want for our children. We are not going to put all our eggs in one basket. We have multiple strategies. Other CODE press conference speakers included students, parents, and teachers. 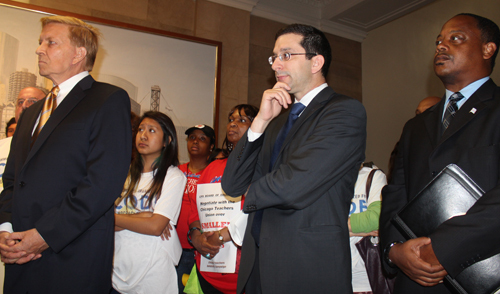 Phil Cantor, a science teacher at North-Grand high school, parent of three CPS students, and representative of Teachers for Social Justice, spoke about the need for the elected representative school board. I would say your cynicism is warranted about Ald. John Moore, as his office delayed the paperwork until 10:03. Emanuel put a lot of pressure on Moore. But your cynicism does not apply to the other aldermen who were going out on a limb. The mayor\'s press office very quickly changed the narrative and distracted voters by shoving the Chick-a-filay story forward for a favorite alderman, Joe Moreno.